It was way back in the early 1980’s while I was driving my car about town that I heard a radio advertisement sponsored by the Toronto Transit Commission also known as the TTC. The ad said that the TTC was holding a poetry competition. Toronto Transit Commission holding a poetry contest? How strange, I thought. They were asking people to write a poem on how to encourage people to use public transit. 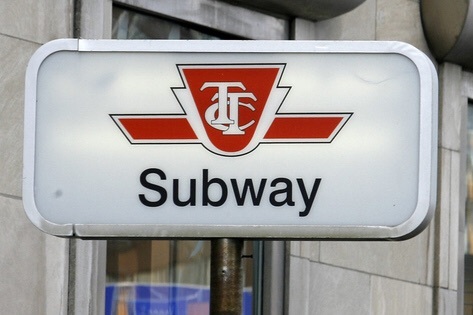 The winning poem would become an actual TTC advertisement and be featured on city street signs. Poems on city street signs? Even stranger, I thought. I pondered that this endeavour would prove to be a challenge. How does one put a poem on a street sign and make it a functional advertisement to promote public transit? CANNOT BE DONE, I told myself before dismissing the subject matter from my mind and eventually forgetting about it altogether. I was driving on a collector lane, and as I was passing by Yorkdale shopping centre near Dufferin Street in Toronto, I spotted a large overhead highway sign. A moment later I passed underneath this sign. That was strange, I told myself. Looking ahead I notice that I am quickly approaching another similar sign. Okay, I told myself, something is definitely going on here. I start looking ahead to see if I was approaching another sign. I looked to my left. What I saw was that travelling a short distance away, there was a TTC Subway going in the same direction that I was. Further, I could see people riding on the subway. That was when I remembered the poetry contest. Somehow, somewhere, a very clever poet did what I had deemed as impossible. They successfully came up with a simple poem, that promoted public transit in a very positive and affable manner. Even decades later, I find myself still smitten with this poem’s charm and simplicity. In fact, I’d like to try my hand at some poetry right now. Okay, so this poem isn’t Whitman or Frost, or even original. Go ahead, call me crazy.